IntegralUI Web 19.1 released, a suite of advanced UI components for Angular 7 and AngularJS frameworks. You can find more information about this release at product page. IntegralUI Web 18.4 released, a suite of advanced UI components for Angular 6 and AngularJS frameworks. IntegralUI Web 18.3 released, a suite of advanced UI components for Angular 5 and AngularJS frameworks. IntegralUI Web 18.2 released, a suite of advanced UI components for Angular 5 and AngularJS frameworks. IntegralUI Web 18.1 released, a suite of advanced UI components for Angular 5 and AngularJS frameworks. IntegralUI Web 17.4 released, a suite of advanced UI components for Angular 4 and AngularJS frameworks. IntegralUI Web 17.3 released, a suite of advanced UI components for Angular 4 and AngularJS frameworks. It consists of 20+ user interface components, directives and services that can help you build modern web applications. IntegralUI Web 17.2 released, a suite of advanced Angular 4 and AngularJS UI components. IntegralUI Web 17.1 released, a suite of advanced Angular 2 and AngularJS UI components. IntegralUI Studio for Web v3.2 released, a suite of advanced AngularJS directives and jQuery Widgets. IntegralUI Studio for Web v3.1.5 released, a suite of advanced AngularJS directives and jQuery Widgets. IntegralUI Studio for Web v3.1 released, a suite of advanced AngularJS directives and jQuery Widgets. IntegralUI Studio for Web v3.0 released, a suite of advanced AngularJS directives and jQuery Widgets. IntegralUI Studio for Web v2.3 released, a suite of advanced AngularJS directives and jQuery Widgets. IntegralUI Studio for Web v2.2 released, a suite of advanced AngularJS directives and jQuery Widgets. IntegralUI Studio for Web v2.1 released, a suite of advanced AngularJS directives and jQuery Widgets. IntegralUI Studio for Web v2.0 released, a suite of advanced AngularJS directives and jQuery Widgets. Column reordering with events: ColumnPosChanging and ColumnPosChanged. Each column header now can display multiple command buttons: drop-down, context menu, etc. IntegralUI Studio for Web 2014 Vol3 released, a suite of advanced AngularJS directives and jQuery Widgets. Greatly improved performance, now load and update time for large data sets is instant. IntegralUI Studio for Web 2014 Vol2 released, a suite of advanced AngularJS directives and jQuery Widgets. IntegralUI Studio for Web 2014 Vol1 released, a suite of 5 advanced jQuery Widgets. Announcement for upcoming release of IntegralUI Studio for Web. You can find more information about this release at IntegralUI Studio for Web product page. IntegralUI Studio 2012 Vol1 released. You can find more information about this release at product page. Announcement for release of IntegralUI Navigator v1.0! 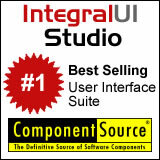 We are proud to announce that IntegralUI Studio is the best selling User Interface Component Suite on ComponentSource. IntegralUI Studio 2011 Vol2 and IntegralUI Lists v3.2 released along with separate list controls releases. You can find more information about this release at product pages. IntegralUI TreeView v3.2 released. You can find more information about this release at IntegralUI TreeView page. IntegralUI ListBox v2.2 released. You can find more information about this release at IntegralUI ListBox page. IntegralUI Studio 2011 Vol1 released. You can find more information about this release at IntegralUI Studio product page. We are proud to announce that Lidor Systems received the Top 100 Bestselling Publisher Award 2010-2011, from ComponentSource. IntegralUI Studio 2010 Vol2 and IntegralUI Lists v3.1 released along with separate list controls releases. You can find more information about this release at product pages. IntegralUI Containers v2.1 and IntegralUI TabControl v2.1 released. You can find more information about this release at IntegralUI Containers product page and IntegralUI TabControl product page. IntegralUI Studio 2010 Vol1 and IntegralUI Lists v3.0 released. You can find more information about this release at IntegralUI Studio product page and IntegralUI Lists product page. IntegralUI ListBox v2.0 and IntegralUI TreeView v3.0 released. You can find more information about this release at IntegralUI ListBox product page and IntegralUI TreeView product page. IntegralUI TreeListView v3.0 released. You can find more information about this release at IntegralUI TreeListView product page. We are proud to announce that Lidor Systems received the Top 100 Bestselling Publisher Award 2009-2010, from ComponentSource. Lidor Systems Announces IntegralUI Lists for WPF and Silverlight! The release is scheduled for Q3 2010. IntegralUI Studio 2009 Vol2 released. You can find more information about this release at IntegralUI Studio product page. Lidor Systems has released new product package, IntegralUI Studio 2009 Vol1, a set of 11 advanced .NET user interface controls. The suite includes docking and tabbed document management controls, advanced data visualization controls, multiple containers which can contain custom controls and controls for grouping and organizing your application layout. All controls have highly customizable appearance, multiple styles, supports XML load/save and fast data loading time. Lidor Systems has released new product package, IntegralUI Containers v1.0, a set of four advanced container controls: Expander, SplitContainer, TabControl and TabDockContainer. We are proud to announce that Lidor Systems received the Top 100 Bestselling Publisher Award 2008, from ComponentSource. IntegralUI Lists v2.1 is released.You can find more information about this release at IntegralUI Lists product page. Lidor Systems Announces IntegralUI Containers v1.0! Create tabs with rich content: Text, Images, Hyperlinks, Custom Controls etc. The release is scheduled for 17 March 2009. Also, a WPF verson of these controls will be available in the next few months. Most of these controls will be available in separate packages (like IntegralUI Lists), and also available as standalone products. IntegralUI Lists v2.0 is released. This product package now contains four advanced list controls: ListBox,ListView, TreeListView and TreeView.You can find more information about this release at IntegralUI Lists product page. The release of IntegralUI Lists v2.0 is scheduled for 15 October 2008. Anyone who has an active subscription at the time of release will be eligible to upgrade to v2.0 for FREE! Lidor Systems Announces IntegralUI Lists v2.0! Create items with rich content: Text, Images, Hyperlinks, Custom Controls, CheckBoxes, Flags, etc. Lidor Systems has released new version 1.2 of IntegralUI Lists product package, with several new features and changes, listed on the product page under "History" tab section. All controls which are part of the IntegralUI Lists bundle have been also updated. Lidor Systems has released new version 1.1.367 of IntegralUI Lists product package, with several new features and changes. All controls which are part of the IntegralUI Lists bundle have been also updated. Lidor Systems has released new version 1.1 of IntegralUI Lists product package, with several new features and changes. All controls which are part of the IntegralUI Lists bundle have been also updated. 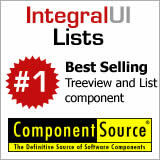 We are proud to announce that IntegralUI Lists is the best selling Treeview and List component on ComponentSource. Lidor Systems has decided to enrich the offer by including the Source Code for all products, starting from 4 Developers License type and up. From now on, by purchasing the Annual Subscription License type with 4 licenses and up, you will receive the Source Code for the purchased product. Also, the Source Code in included with each Annual Subscription Renewal. For more information about this and for price options, please visit our Online Store. Lidor Systems has released new product package, IntegralUI Lists v1.0, with three new products: IntegralUI TreeView for rich hierarchical treeviews; IntegralUI ListView for display, selection and sorting of data and item collections; IntegralUI TreeListView with combined power of TreeView and ListView. For more information about the bundle and each of the individual products, please visit the products page or click on the product's links above. New, redesigned and improved web site has been launched today, with new navigation structure. 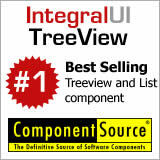 We are proud to announce that IntegralUI TreeView is the best selling Treeview and List component on ComponentSource. Lidor Systems has released IntegralUI TreeView v1.4. Every tree node can display more than one image. In predefined drag&drop, reorder mark appears showing where tree nodes can be placed. Focus style, used to show nodes when they are focused. Control over visibility of custom controls inside tree nodes. Control over update of layout logic and painting are separated. We are proud to announce that IntegralUI TreeView is placed on second place as best selling Treeview and List component on ComponentSource. Lidor Systems has released IntegralUI TreeView v1.3. Lidor Systems has released IntegralUI TreeView v1.2.47. Lidor Systems has released IntegralUI TreeView v1.2. Lidor Systems has released IntegralUI TreeView v1.1. We are proud to announce that LidorSystems.Collector is placed on third place	of the	best selling user interface components on ComponentSource. With great pleasure Lidor Systems is announcing its release of IntegralUI TreeView v1.0 for Visual Studio .NET. For more information and product description visit the product page. Lidor Systems Announces IntegralUI Lists v1.0. Lidor Systems has released LidorSystems.Collector v1.7. Lidor Systems has released LidorSystems.Collector v1.6, with enriched support for design of wide variety of UI. With great pleasure Lidor Systems is announcing the future release of LidorSystems.Collector v1.5, targeted for final release in late September 2005.
and many other features suggested by users! LidorSystems.Collector v1.5 will also include some bug fixes, for bugs detected since the last release. In such way, LidorSystems.Collector tend to be the most comprehensive .NET class library specialized in designing application workspaces with docking and floating windows, tabs and tabbed MDI documents. And together with great price options, which includes 1 Year of Free Upgrades and Support, this is a deal for every developer which will be hard to resist! If you need more information about LidorSystems.Collector, please visit the product’s web page or download the full-functional evaluation copy of LidorSystems.Collector v1.0.1. Lidor Systems has started the support forums, which are a set of discussion forums for the users of our software to find useful information and provide feedback to our support and development staff. Also it is a great place to get other developer's opinions and experience with Lidor Systems products and services. In order to offer a top quality service for online purchasing, Lidor Systems has started the ESD Store with his sales partner ComponentSource. The online store uses advanced encrypted SSL on every transaction processed, which means that all of the customer personal information including the credit card details are first encrypted using the HTTPS (secure) protocol before being transmitted to our servers. With great pleasure Lidor Systems is announcing its release of LidorSystems.Collector v1.0 for Visual Studio .NET. For more information and product description visit the product page.